I have spent the day reworking how damages are handled. In fact, since there basically was no damage system in the game, to be precise let's say I have spent the day implementing that feature. Most of the time, weapons will just oneshot enemies, so not much will change, except for a few weapons like shotguns, which now require multiple projectiles to hit an enemy to kill him. Punch has also been nerfed, it now requires 3 punches to kill an enemy, but if you punch an enemy from his back, you can kill him instantly. The cooldown between 2 punches has also been increased. Enemy knockback when hit by a bullet or a punch/kick, has been changed. Enemies can now break windows during that knockback. 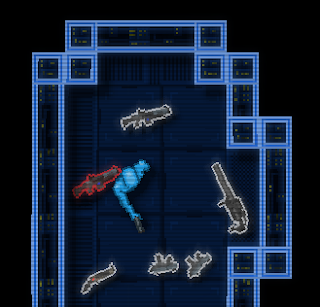 Enemies also get pushed when killed by weapons, this will make deaths a little bit more visually rewarding. Death animations will be changed later. We released our first trailer today, it pretty much shows the current state of the game.